The percentage of club-trained players in Premier League squads has reached a new low, a study says. Research by the CIES Football Observatory found 11.7% of top-flight players graduated from their club's academy, down from 13.8% last year. Across 31 top European divisions the figure has dropped below 20% for the first time since figures began in 2009. Clubs are "increasingly reluctant" to give chances to academy players, says study author Raffaele Poli. A club-trained player has spent at least three seasons between the ages of 15 and 21 training with their current side. Where did it go wrong for Moyes in Spain? Overseas players account for 59.9% of Premier League footballers, the second-highest figure in Europe behind Cyprus. That is higher than all other so-called 'big-five' nations - Italy (56.5%), Germany (45.9%), Spain (39.9%) and France (30.5%). In addition, 41.1% of Premier League players are internationals, eclipsing 30.9% in Germany's Bundesliga and 19.9% in Spain's La Liga. "The average age of footballers in Europe has reached a new high of 26 years," Poli says. The average age of a Premier League player has never been higher at 26.9 years, but has remained relatively stable since an average of 26.7 in 2009. The introduction of the Premier League's £320m elite player performance plan (EPPP) in 2012 was designed to try to improve the quality of young English players and increase their opportunities in first teams. But an increase in the percentage of foreign players over the past three years means that many youngsters now need to transfer clubs or go out on loan before playing in the Premier League. Tottenham have the Premier League's largest percentage of club-trained players in their squad at 32%. Three Spurs players - striker Harry Kane, midfielder Ryan Mason and winger Andros Townsend - all went on loan before making their first-team breakthroughs and have since played for England. Arsenal are second with 24%, Manchester United third with 20%, while Swansea City and Bournemouth have no club-trained players, according to the study. The percentage of foreign players at Chelsea - 83.3% - is the third-highest in Europe and 12.5% of their squad is club-trained. That includes 19-year-old midfielder Ruben Loftus-Cheek. The Premier League said 31 home-grown players had made their debuts this season, but recognised they had come through a variety of routes. It added: "The number one stated aim of the EPPP is to develop more and better home-grown players capable of playing at Premier League level. English clubs are absolutely committed to this. "For some players, like Manchester City's Raheem Sterling, they go straight from academy to under-21 football and then to the Premier League. 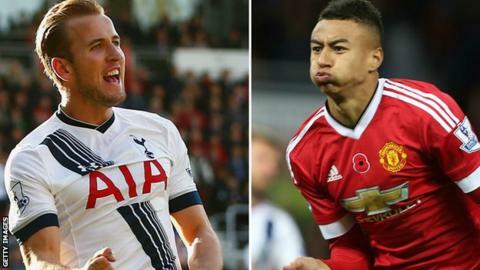 For others, like Kane and Manchester United's Jesse Lingard, it was hard work at their academies, combined with U21 football and loans to the Football League prior to making an impact in the Premier League." Is it getting worse for Premier League youngsters? The Football Association has outlined plans to try to boost the number of home-grown players in England by limiting the number of non-EU players. But Premier League clubs spent a record £1bn on transfer fees in 2015 with 65% of that paid to overseas clubs for players. Manchester United set a world record fee for a teenager when they paid £36m to Monaco for 19-year-old striker Anthony Martial and from next season clubs will receive a further injection of money when a new £5.14bn TV deal kicks in for three years. CIES Football Observatory data shows that the percentage of club-trained players in the Premier League was at 17% in 2009. And association-trained players - those who have come through a club's academy but now play for a different team - has dropped from 51% last year to 47.6%, but is above the lowest figure - 47.1% - set in 2013. Poli added: "Although no-one would contest that youth is the future of football, the study shows that top-division European clubs are less and less courageous when it comes to giving club-trained players a chance to prove themselves." But the Premier League said: "With the likes of Sunderland's Duncan Watmore, West Ham's Reece Oxford and Tottenham's Joshua Onumah recently making Premier League debuts, the belief is that the foundations that the EPPP has been laying since 2012 will continue to produce and progress talent in growing numbers." European football's governing body Uefa, which ensures that at least eight association trained-players are in squads for competitions such as the Champions League, told BBC Sport: "Uefa believes that the issue of locally-trained players is very important for the development of football at all levels." • The highest percentage of club-trained players in a current squad is at Belarusian side FC Gomel, standing at 91.7%. Spain's Athletic Bilbao is fourth at 63%. • Slovenian side Zavrc have the highest percentage of foreign players in their squad at 88%, with Italy's Roma second at 85.2% before Chelsea in third at 83.3%. • Italian side Chievo are the only club whose average player age is over 30. Stoke are the Premier League's eldest team at 28.7 years old. • Manchester United's Champions League group opponents Wolfsburg have the tallest team in Europe, averaging at 187cm or 6ft 2in. Stoke are the Premier League's tallest team. • Premier League players have been at their clubs for the longest time, at an average of 2.82 years. The longest average stay is at Everton - 4.14 years. Kane - new breed of home-grown hero? Read more on Home-grown heroes - Is Harry Kane part of a new breed?